Call today for a free estimate (734) 459-3707! Same or next day service is available in most cases. Yard friendly equipment, no trucks on lawn. Same or next day free estimates. Every job is performed with owner on site. Property management (condos and apartments), home owner associations, municipal, and commercial clients. We now have over 3,000 satisfied customers, which includes residential, and now we’ve branched into property management (condos and apartments), home owner association, municipal, and several commercial clients. We have been from the beginning a family run business. When you call you will talk with myself or my wife Kendra. Hear it straight from Mike! Q. Why do my Maple trees have spots on the leaves? A. The spots on the Maple leaves are caused by a common fungus called tar spot disease. It’s a cosmetic problem that typically doesn’t impact the tree long term. It’s one of the easiest most common diseases to diagnose. The first spots show up in early summer as small light green to yellowish spots which get larger into fall turning black. Symptoms tend to be more common on trees growing in moist sheltered conditions. Sometimes it will cause premature leaf drop, but usually will not affect long term health of the tree. Cleanly raking the infected leaves in fall will help to discourage the return the following season. 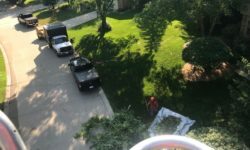 Fungicide applications can be used, but are not extremely effective when the trees are in neighborhoods where all the other trees are not being treated. More info on tar spot disease can be found at migarden.msu.edu. 1) Shaping and pruning trees when they're young and smaller will help to develop the ideal shape and direction for growth. 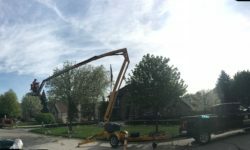 This can eliminate the need for more expensive tree service when the trees reach maturity. 2) Thinning the canopy of the trees on your property will help allow the sun to reach the ground giving your lawn a more lush look. 3) Some people are not aware that the trees between the street and the sidewalk are the homeowners responsibility to maintain just like removing the snow or mowing the lawn there. In most H.O.A the minimum required height for the canopy is 7 ft off the ground. This allows for people to walk and bike without risk of hitting their head. Protect yourself from liability by keeping these trees pruned up. 4) Apple scab is a very common problem with flowering crab trees throughout the Midwest. Keeping these trees cleanly pruned inside of all sucker growth, and deadwood, can reduce or even eliminate the need of toxic chemical treatments. 5) Don’t plant trees that will mature to over 30ft tall closer than 10ft from your home. This risk of damage to your foundation and roof will cause premature removal of the tree. Michigan soil tolerates a wide variety of ornamental trees both flowering and non for these close to the home.